The book provides both the theoretical and the applied background needed to predict magnetic fields. The theoretical presentation is reinforced with over 60 solved examples of practical engineering applications such as the design of magnetic components like solenoids, which are electromagnetic coils that are moved by electric currents and activate other devices such as circuit breakers. Other design applications would be for permanent magnet structures such as bearings and couplings, which are hardware mechanisms used to fashion a temporary connection between two wires. 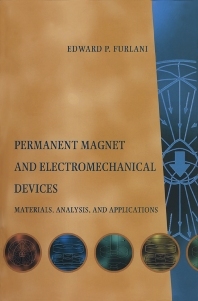 This book is written for use as a text or reference by researchers, engineers, professors, and students engaged in the research, development, study, and manufacture of permanent magnets and electromechanical devices. It can serve as a primary or supplemental text for upper level courses in electrical engineering on electromagnetic theory, electronic and magnetic materials, and electromagnetic engineering. Engineers, applied mathematicians, and physicists; Materials scientists - magnetic materials; Technicians engaged in the development, manufacturing or characterization of permanent magnet materials, permanent magnet devices, or electromechanical devices; electrical engineering students.